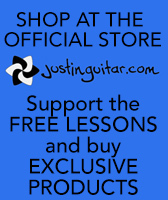 TA Complete Beginner Guitar Course using Play Along Songs! 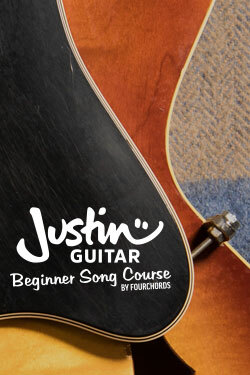 I teamed up with the cool people at Musopia to bring you the "Justin Guitar Beginner Song Chord App by FourChords" which does what is says on the tin - a beginners guitar course that focusses on playing songs, it's a playalong style, so you learn some chords and then immediately learn to use the chords (and strumming) in songs. There are exclusive (new) instructional videos that show you the chords and strumming, chord changing exercises and chord change songs and my famous "One Minute Changes" are included with stats! Check it out more on the video demo below - it's free to download and try out and is available for both iOS and Android and in over 100 countries! Updates to be announced very soon... it's only just out but there will be new songs and features every month!